We can consider ourselves lucky to even be watching this video. Over the weekend, Yella Beezy was nearly murdered in a drive-by shooting but thankfully, he's alive to speak about it. October 14 was a terrible day in the world of hip-hop as three artists were shot. Rap-A-Lot artist Marley G passed away as a result of his injuries but thankfully, both Yella Beezy and Koly P survived shootings of their own. Last night's BET Hip-Hop Awards saw many must-see performances from Cardi B, YG, A$AP Rocky, Lil Pump and others but one of the most noteworthy was Yella Beezy's. 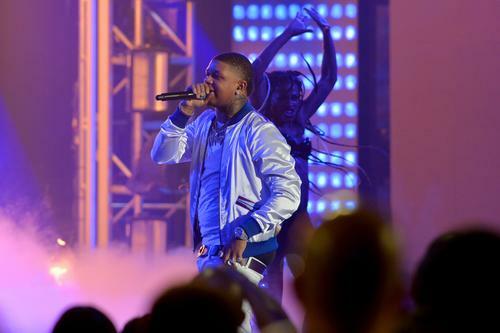 Of course, the Hip-Hop Awards were taped a few weeks ago so this all happened before the rapper was shot but Yella Beezy was one of the performers, going on near the end of the ceremony. Beezy shared a video from his hospital bed as he recovers, watching himself on stage and penning a thankful message as he's able to see another day. "Im in a blessed position because ima blessed individual," wrote the artist. "God got the last say so Dallas tell the world we on @bet .... we made it !!!!!" It's great to see him doing better than a few days ago. Check out the video below. Prayers up for Yella Beezy.